A first look at what it's like to play Anthem. 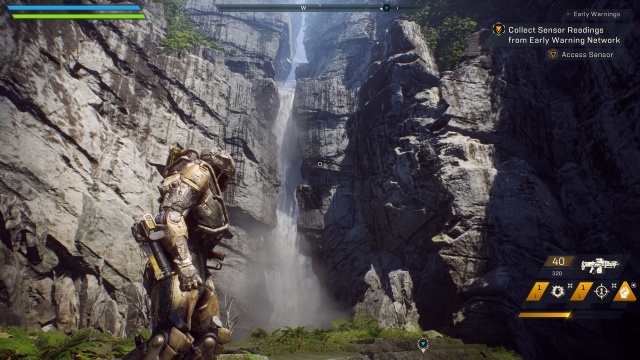 I was able to spend some time playing Anthem recently, getting my first real look inside a game that's been developed in relative quiet, especially for a game in which BioWare and EA are involved. I was able to play about four hours into the game, get a preview of the levels that will be released as part of the game's demo, and then play some of the high-level content. It was a bit like being handed a book and being allowed to read the first several chapters, a chapter from the middle, and then the final one at the end of the book, so I don't have the full story but I have a pretty good idea of what to expect from Anthem. In this preview I'll be looking at those opening chapters, and will share what I saw in the end-game in another article in the near future. And while describing the game will require giving you a look inside the world of Anthem, I will refrain from revealing any details on the game's storyline to avoid spoiling anything for you should you decide to play Anthem yourself once it is released. Anthem is set in a world that was once ruled by god-like beings known as the Shapers. The Shapers harnessed vast power known as the Anthem of Creation and used it to create worlds filled with creatures and colossal monsters, but they vanished before their work was complete. While the Shapers are long gone, they left behind ruins and artifacts infused with Anthem. Some leach power into the world, continuing to create massive rampaging creatures, while others lie dormant, waiting for someone to rediscover their purpose. Humanity has still managed to flourish in this chaotic world, using technical achievements and great walled cities to thrive in spite of the danger. And they developed the Javelin exosuits to give their defenders super human abilities. This is where you come in. You're a Javelin pilot, part of an elite force of mercenary-like defenders known as the Freelancers. Your job is to protect the city and the scientists who go out into the world seeking Shaper knowledge, to prevent Shaper artifacts from falling into the hands of one of the nefarious factions that you share the world with, to take down rampaging colossal creatures created by the Anthem, and to explore the world outside of the city walls. When you begin playing the game's prologue you'll be given your first Javelin, the Ranger. The Ranger is the generalist suit of the four Javelins available, making up for its lack of specialization with its versatility. Think of it in a way as the game's assault soldier class. The game's opening serves as a tutorial, so you won't be able to customize this Javelin or really put it through its paces right away. You will however get a feel for how combat works in the game. You'll wield a primary weapon, and the available weapon types will be familiar to anyone who plays shooters ' assault, marksman, and sniper rifles, shotguns, LMGs, launchers, etc. ' but your suit comes with attachment points that can be used for additional weapons and mods and each Javelin class also has a super. The Ranger that will serve as your introduction to the Javelins comes equipped with grenades and homing missiles. Once you make it through the prologue you'll face your toughest decision of the game ' which Javelin do you choose to pilot? Initially you'll have to stick with your choice for a while, but as you level up you'll be given the opportunity to unlock another, and will eventually have all four at your disposal. In addition to the Ranger, you have your choice of the Colossus, Storm, and Interceptor. The Colossus is the heavy of the Javelins, a tank that looks like it could have come from Iron Man's Hulkbuster collection. You'll be slow, but you'll be able to take and dish out a lot of punishment. Your suit can be slotted with heavy weaponry like artillery and flamethrowers. The Storm harnesses elemental power. You can float above the battle, dishing out punishment with your primary weapon while staying out of the reach of earthbound enemies and unleashing elemental powers from your suit's equipped weapons. The Interceptor is like the ninja of Javelins ' lightly armored but incredibly fast, moving in for quick strikes and then dodging out of the way of counterstrikes. For my first Javelin I chose the Colossus. There was a big dangerous, unknown world out there and I wanted to take my first steps into it covered in armor and carrying a cannon. 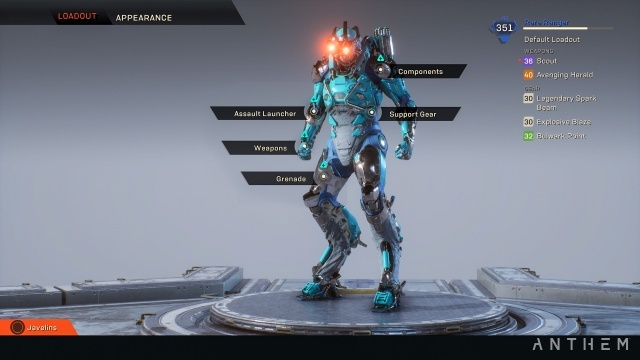 Once you have your Javelin you can take it to the Forge to customize it to your liking. At first all of the connection points won't be enabled, but as you progress in the game you'll unlock them in short order. You also won't have a lot of options for the points that you do have ' you'll have to go out into the world and complete missions to find new weapons, equipment, and mods for your Javelin. There's also a crafting system in place in which you'll obtain blueprints and then retrieve materials from the world to build new items in the Forge. Cosmetically you have access to a full color wheel to paint different parts of your Javelin to your liking. Skins and decals are available, too, and they look like they will be available for grind currency or a mix of grind and premium currency, although this could very well change by the time the game is released. It looks like interchangeable parts such as new helmets will be available, but there weren't any available to check out in the build that I was playing. You'll begin the game in Fort Tarsis, a human settlement hub area that serves as the game's vendor and social space, as well as the home for many of the NPCs who will be giving you missions to complete. When you're ready to leave you can queue up one of your available missions or just enter one of the world's Freeplay areas to explore, fight, and discover side missions. The missions can be played by up to four players, but you can solo them if you prefer. The game is designed to emphasize teamwork and social interaction, though, so it's best experienced as a full team with a mix of Javelins. When you start a mission the game will automatically match-make for you, but with support for full drop-in/drop-out at any time you can start solo and then wait for other players to drop-in or put out a call for others to join you. Your first time outside of Fort Tarsis will be memorable. First, the scale of the world is incredible. High mountains are flanked by waterfalls that drop to the forested valley floors below. Rivers flow into deep lakes, caves and canyons beckon you to enter them, and ruins abound that are just begging to be explored. But all of that will have to wait for Freeplay as you'll have to remain focused on your mission, but getting there will be part of the fun. The Javelins let you soar through the sky, zooming off into the distance, performing aerial maneuvers, or hovering above it all to take it all in. 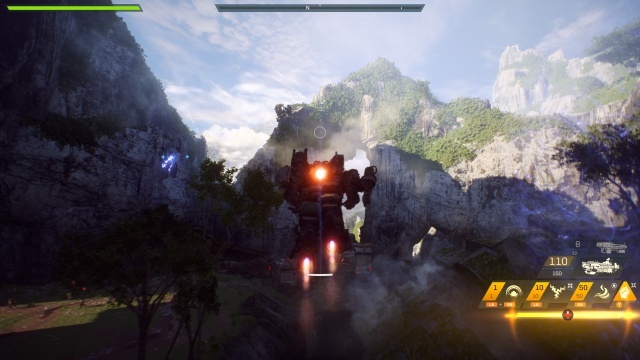 Anthem really nails the feeling of flight, making it feel fun, intuitive, and liberating. There is one fly in the ointment, though. Your thrusters will eventually overheat, sending you straight to the ground when they do (on the bright side, you don't suffer from fall damage when wearing a Javelin). You can either wait for them to cool down before taking flight again or you can find a source of water to quickly dissipate all of their heat. Now remember those waterfalls that I mentioned? An experienced Javelin pilot knows to look for them while in flight because a quick pass through one and your thrusters are completely cooled again. And while on the topic of water I should mention that Javelins are well-suited to travel below the surface as they are above. There's no need to tap a swim button or look for air pockets, the Javelin is as maneuverable underwater as in the air and contains its own air supply. I didn't have a lot of time to explore Anthem's aquatic spaces, but I did see that they are teeming with life and filled with caverns and twisting canyons. The biggest question in my mind before playing Anthem was whether or not BioWare could make a good multiplayer shooter, and after playing it I know that the answer is 'yes'. 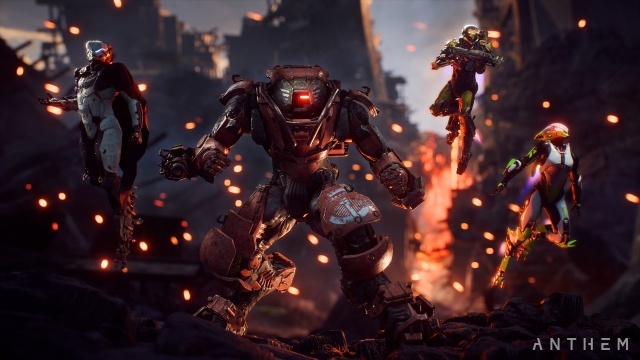 Combat is exciting, challenging, and fun in Anthem. The weapons are responsive and handle great, and the special weapons and attacks on the Javelins open up a myriad of possible attack tactics (in fact, the game gives you bonus XP for combo attacks with different weapons). One of my early favorites was to take my Colossus airborne and then bring it down to the ground while executing a melee attack. This ground-pounding attack was devastating to nearby enemies and had a powerful knockback effect. After landing I'd engage the flamethrower I had equipped on my Javelin to roast the surviving enemies before they got a chance to get back up on their feet. 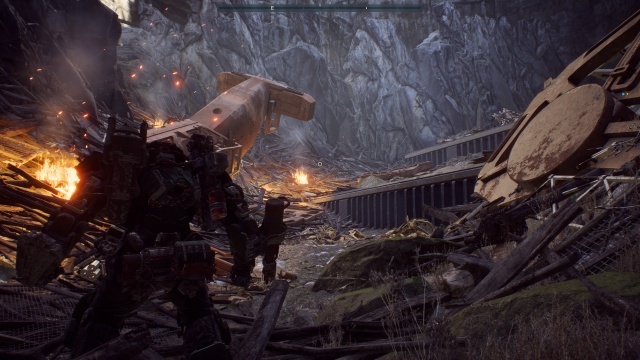 In addition to the missions, Anthem provides Freeplay areas in which you can explore, battle the local monsters, and discover side missions. I spent a little time in these areas, primarily flying around and enjoying the scenery, but I did let myself get pulled into a couple of side missions. Freeplay areas are multiplayer zones, but I had a look at them on my own and the side missions almost made me regret that choice. They are challenging, with multiple objectives and hardened enemies and bosses. That's all that I can reveal for now. I'll have more on Anthem next week in Part 2 of this preview, including my time channeling Iron Man in my high-level Storm Javelin.